Summer came to our house a few weeks ago when the boys first got out of school. I feel a little guilty because half their summer will be spent with a very pregnant mom and that is no fun. I have been looking into different vacation spots for mid to late August after this surro-baby is born, so that we can have a quick family getaway together before school starts again. Surprisingly, Mississippi's Gulf Coast is at the top of my list right now and they have some amazing family vacation resorts that would be perfect for a summer getaway. When I used to think of the Mississippi Gulf Coast, a vision of Biloxi and casinos came instantly to mind. After doing some research on the area though, there is so much more the coast has to offer. From dolphin encounters to waterparks, there is something for every member of the family to enjoy. Of course, at night, adults can enjoy some fun in the local casinos, but there is plenty for the kids to do as well. Mississippi river tours are available to give you a breathtaking tour of the area. Kids can even go out on a real shrimp boat and watch the captain bring in the daily catch and explain the different creatures. Ride the ferry out to Ship Island where there is clear water, white beaches and the historic Fort Massachusetts. Add in some great children's museums and you have a recipe for one amazing family vacation. 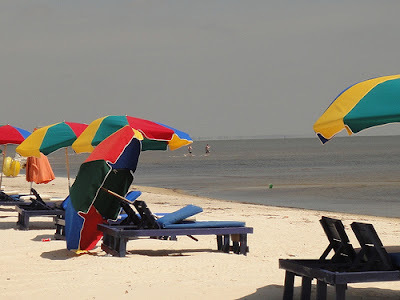 I am still doing my research and narrowing down my options, but the Mississippi Gulf Coast sure does sound like the perfect family getaway destination this summer. Have you ever been? Feel free to share your experience below! I'll go with you if you go! I could totally use a nanny to help with the boys Liz. Free trip for nanny help? My family loves going to Biloxi. Haven't been... but sure would like to! My sister and her husband just wrapped up a vacation (to celebrate his homecoming from deployment) on the Mississippi gulf. They loved it! This sounds like a blast. That beach looks so good right now. I want to visit! We always go to the AL gulf coast or FL panhandle. It would be fun to mix things up a bit. I could use a summer getaway! I would love a summer getaway! Sounds like a nice place to be! I would love to take my family to Florida. I've really never spent much time in Mississippi, only driven through. But, I'd love to go back. I would love to go to the Mississippi coast, it looks gorgeous! It looks beautiful. I've never been! I've never been but I'd sure like to! I have never traveled to Mississippi. It looks like a great place to visit. I've been through Mississippi, but have never stopped on the coast. Looks gorgeous, sometimes I forget what beautiful beaches we have right here in the US! I have been to Mississippi. I was born in La. so I frequently went to Mississippi's Gulf Coast as a kid with my family. I have not been there in like forever though. I miss going. We spent some time on the Gulf coast in Panama City Beach about 4 years ago and it was lovely. I like that part of the country. Seems like a nice place to vacation. I have been to Tunica a few times to gamble. I need a vacay!! Loved reading this. I've never been to Mississippi, but I'd sure love to go! This looks like a great relaxing and fun vacation spot. I've been to Mississippi's gulf coast and loved it! It's gorgeous and not quite as crowded as other beaches I've been to. It looks like its a great place to take a vacation, I have never been on vacation before and recently have decided one is in need, thanks for the review. I never thought of visiting!